Supercell's Clash of Clans has generated more than $4 billion since release making it the highest grossing game on the App Store in the last 10 years. 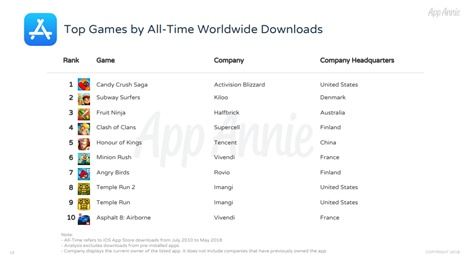 That comes from App Annie, which complied data from the iOS App Store from July 2010 to May 2018. Following on from Clash of Clans, the second and third spot of the consumer charts are taken by King’s Candy Crush Saga and Mixi’s Monster Strike. The download charts for the same period were topped by Candy Crush Saga, which racked up 280 million downloads. Kiloo’s Subway Surfers and Half Brick’s Fruit Ninja placed in second and third. In terms of consumer spend by company, Chinese behemoth Tencent topped the chart followed by Supercell and Knives Out developer NetEase. 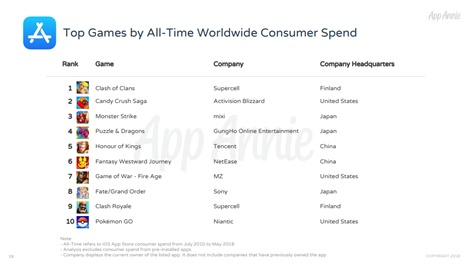 Tencent's biggest generator is mobile MOBA Honour of Kings (Arena of Valor), which according to SuperData made $185 million in April 2018 alone. Also among Tencent’s portfolio is a slew of Playerunknown’s Battlegrounds games made for mobile. Its Western release PUBG Mobile recently surpassed 10 million daily active users worldwide.